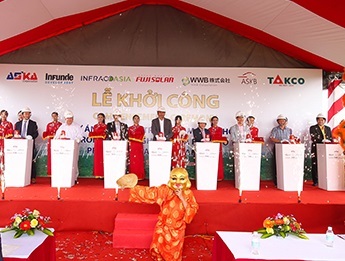 On January 22, 2019 in Cam Tan commune, Cam Lam district, Khanh Hoa province, ASKA Joint Stock Company (JSC) held a ceremony for starting the project to install rooftop PV system in combination with the high tech agricultural production Aska Farm 1. With this project, ASKA JSC will form a close series of the farms in combination with the modern industry to provide products of high quality and electricity from the rooftop PV system to the city. ASKA JSC hopes that the project will contribute to improving the efficiency of land use, building a commodity production agriculture associated with sustainable ecological development, and creating the typical models on production with a high and safe quality.